A pre-flown SpaceX Dragon cargo capsule sits atop the company's Falcon 9 rocket at NASA's Kennedy Space Center in Florida on June 1, 2017. That day's planned liftoff was called off because of lightning. The first launch of a pre-flown SpaceX Dragon cargo capsule will have to wait until at least Saturday (June 3). The used Dragon was scheduled to launch toward the International Space Station today (June 1) at 5:55 p.m. EDT (2155 GMT) atop a SpaceX Falcon 9 rocket. But lightning near the launch site, NASA's Kennedy Space Center in Florida, nixed the attempt. "Standing down due to lightning. 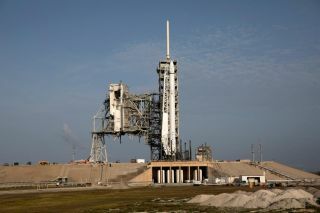 Backup launch opportunity on Saturday, June 3, at 5:07 p.m. EDT or 21:07 UTC," SpaceX representatives said today via Twitter. You can watch Saturday's launch attempt live here on Space.com, courtesy of NASA. Flight rules require that the launch site and surrounding area must be "clear" of lightning for at least 30 minutes before liftoff, NASA officials explained. The lightning strike occurred about 25 minutes before today's slated launch time, which was an instantaneous window (meaning it could not be pushed back today). The uncrewed Dragon is loaded with nearly 6,000 lbs. (2,700 kilograms) of scientific experiments, hardware and other supplies for astronauts aboard the International Space Station (ISS). This particular Dragon has flown to the ISS once before, back in September 2014. Its reuse is part of SpaceX's effort to develop and deploy fully and rapidly reusable spaceflight systems, an innovation that company founder and CEO Elon Musk has said could spur space exploration by slashing costs.